Image caption The hotel is described as being "down to earth with free parking"
A council has spent £2.35m on a hotel in Yorkshire 75 miles away from its Lincolnshire headquarters. 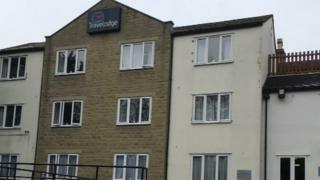 West Lindsey District Council said the Travelodge, in Keighley, West Yorkshire, would generate extra income. Critics said the authority should have consulted with residents on the deal, and looked to invest in its own area. The deal emerged after a freedom of information request by BBC Radio Lincolnshire. The authority, which has its headquarters in Gainsborough, said it wanted to protect local services and the hotel was bought with funds from its own internal borrowing. Council leader Jeff Summers said: "It was obvious we either had to make serious cuts to services... or go into the commercial world and generate an income for the council. "We are looking at a whole range of investment opportunities, mainly in property, where we can guarantee a return on that investment." While not dismissing the idea, some local residents voiced concerns they were not consulted over the authority buying a hotel in a different region. Others said the plan was "crazy". West Lindsey, which purchased the hotel in October, previously lost money after investing £7m in failed Icelandic banks. At the time it said it hoped to recover about £6.4m. Earlier this year, it partnered with a local developer to create a joint venture company to help regenerate Gainsborough town centre. Local government expert Prof Tony Travers, said while not common more councils were looking at commercial investment opportunities. He said as well as property one local authority he knew of had invested in a bank in order to produce longer term returns. In 2016, Portsmouth City Council bought a parcel distribution warehouse near Birmingham, as part of a new income drive. It also bought a Waitrose store in Somerset for £13.2m.